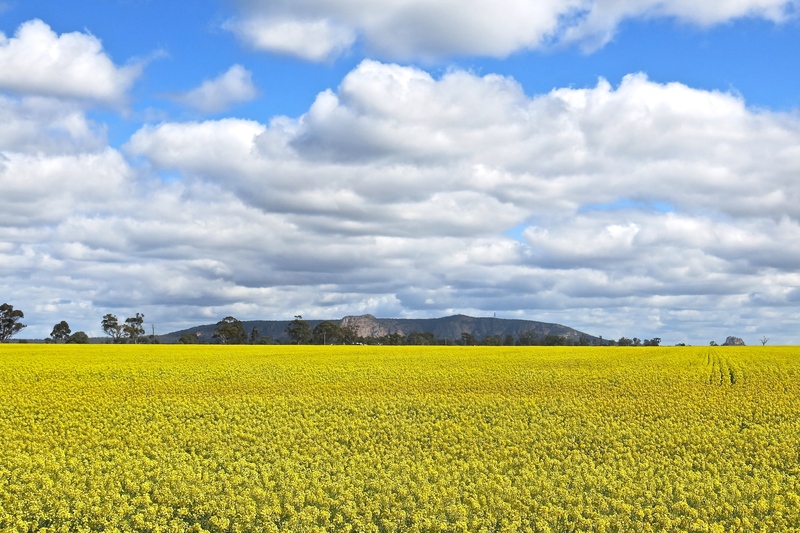 Mt Arapiles, the very end of the Great Divide, poking its head out of a canola crop. Victorian city mice tend to forget they have country cousins. It’s not deliberate. They just get bound up in the haste of the city and the rather limited boundaries of their geographical horizons. That’s a shame, because there is so much to enjoy in the extra-urban world. With two friends, Barbara and Graham, we thought we’d design a little tour, just a week, to revisit where we’d grown up, to chase up some of our favourite places but also to stretch out and drink in some of the less familiar big skies of the northern Wimmera, a region not famous for its tourist draw cards. What follows, however, provides some evidence to the contrary. Would you travel with these people? 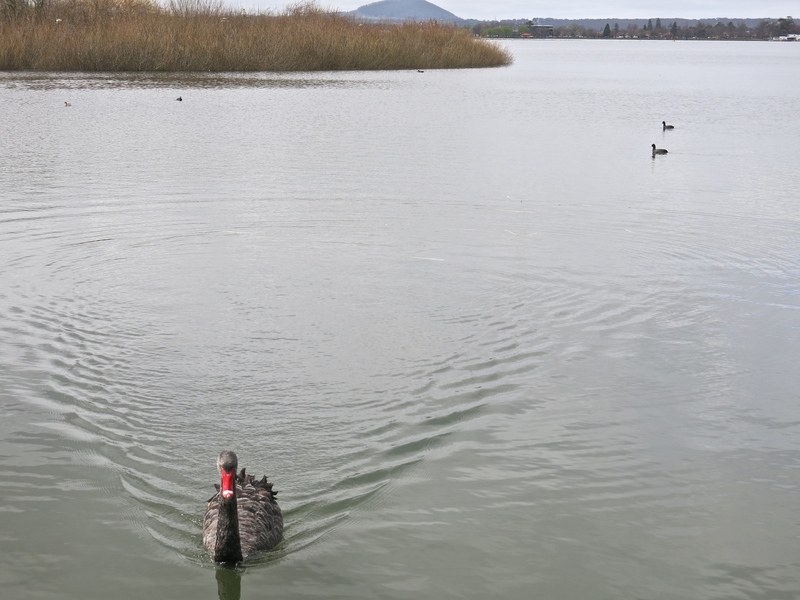 We drove up the Western Highway for lunch at Lake Wendouree Boathouse and some testing of the quality of the recent products from the Langhi Ghiran winery. 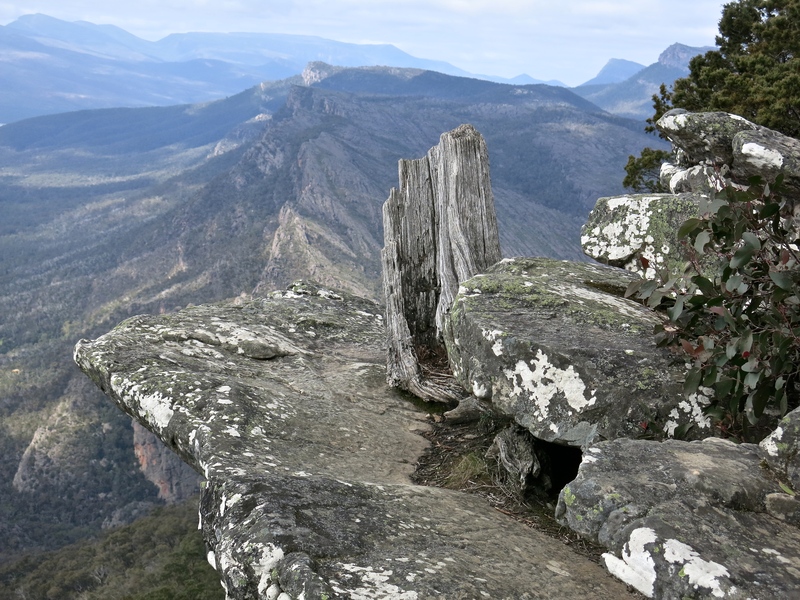 The destination was the Grampians. 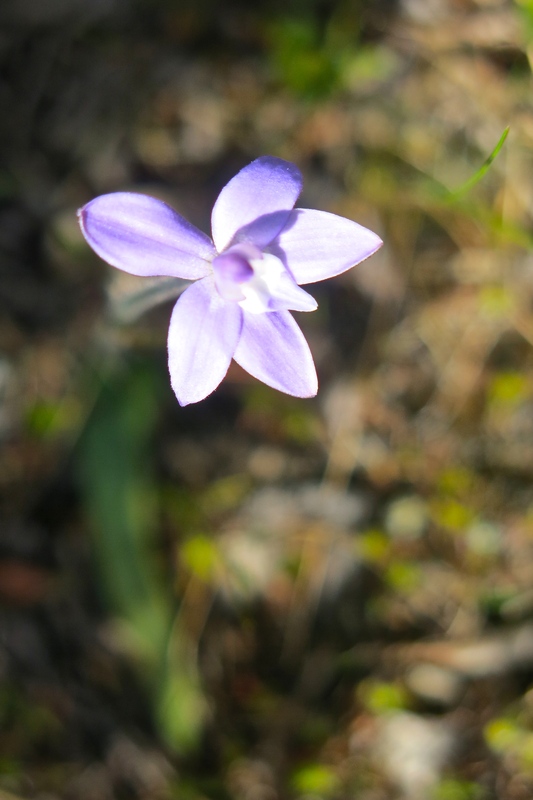 Graham and Barb were interested to see the burnt relic of Girin Flat; Myrna wanted to get some stimulus material — photos, vegetal matter, images — for a current painting project; and we all wanted to see the wild flowers. The wild flowers were only just coming out; they’d be at their best in another three weeks or so. 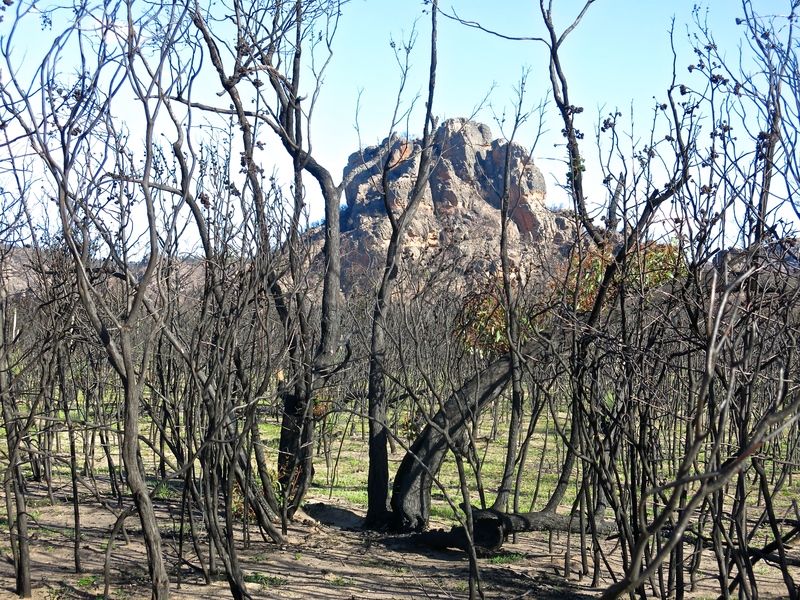 The big interest was in what we could see of the recovery from last summer’s fires. 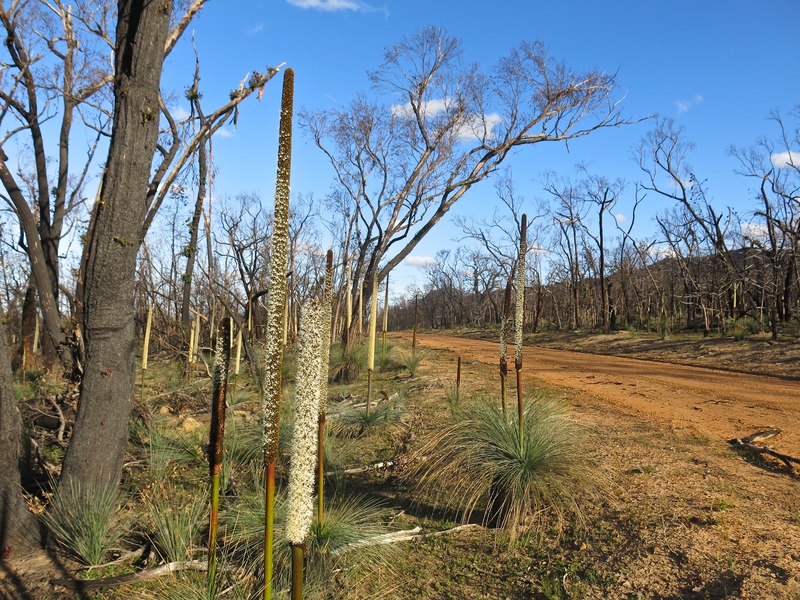 The blackboys (Xanthorrhoea Australis, Australian grass trees) in particular had shot and for long stretches of the road round the northern Grampians were everywhere. It’s rare to see them quite so floral. Hollow Mountain still looked its distinguished self even though much more naked than usual. Trip Advisor moment: we ate and drank well at the newly duded-up Kookaburra Bar and Resto and, as part of a theme, enjoyed the Kookaburra Motel as much as we usually do. Meanwhile in Hamilton Keith was casting through the personal ads (‘Mature, full-figured woman. Ask for Jazz…’) in the Hamilton Spec when his eye fell on an ad for opera at Alan Myers‘ remarkable establishment in Dunkeld. His three-chefs-hat gourmet restaurant/pub, the Royal Mail, enables one to explore simply all the varieties of foam available … let’s just say food adventures, and so they are. Bar, bistro, fancy bit — all at the foot of the looming Mt Sturgeon. The establishment over the road, next to the antique bookshop, holds the RM’s wine collection. But then there’s the family gardens (do check this link out, a great description of an extraordinary place) and so on and so on. 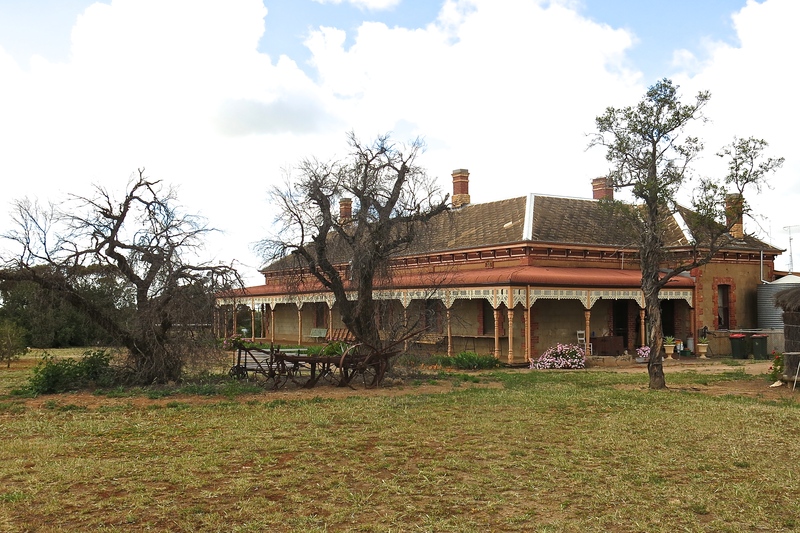 The opera was on at the auditorium /gallery, newly minted out of Grampians sandstone and attached to a portion of the house. (Adjacent to the croquet lawn, but some distance from the tennis area, etc.) On its walls were, I would say, 3-4 million dollars worth of art: Martens, Piguenit, von Guerard, 15 or so early Australian masters, and a version of Benjamin Duterreau’s ‘George Augustus Robinson’. 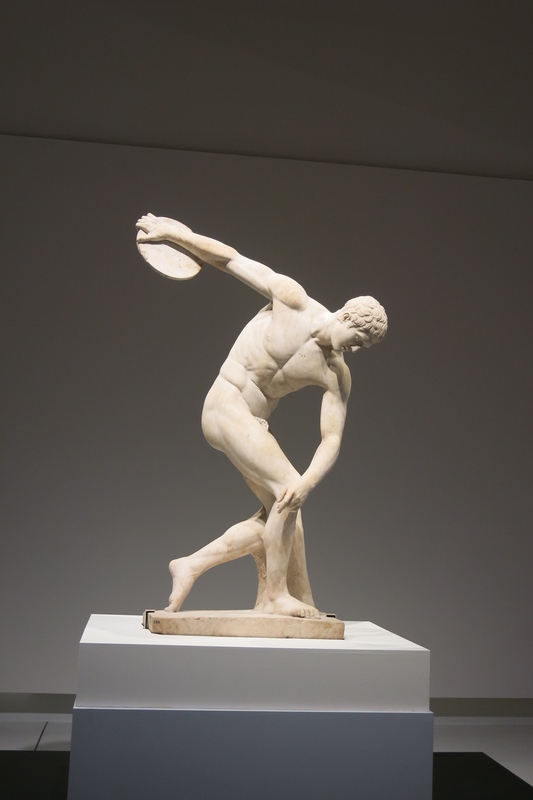 The other is in the Australian National Gallery. 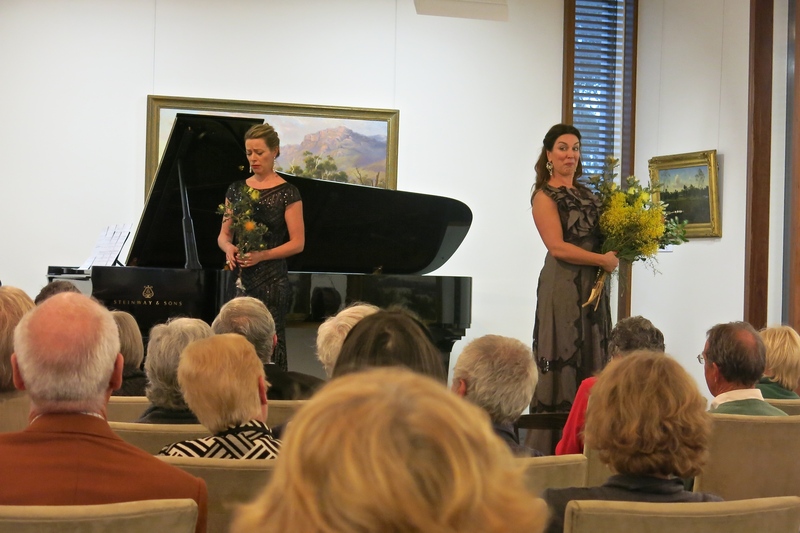 Robert Divall introduced himself and the artists, Antoinette Halloran (at right) and Dimity Shepherd. Both were fine singers. They sang the hits, we marvelled and then went off to eat shaking our heads in just slight wonderment. When we discovered that our 50 dollar tickets included payment for our meals at the RM they wagged violently. Graham led the flight to the car before those in charge changed their minds. 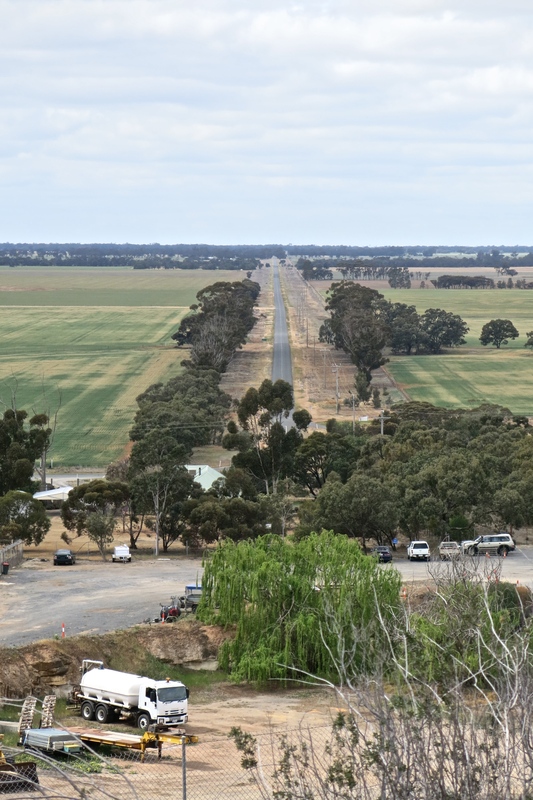 A night at the Rippon Road premises and a tour of Arborline is always highlight of a trip to Hamilton; then to Horsham up the Henty Highway the surrounds of which were looking magnificent. 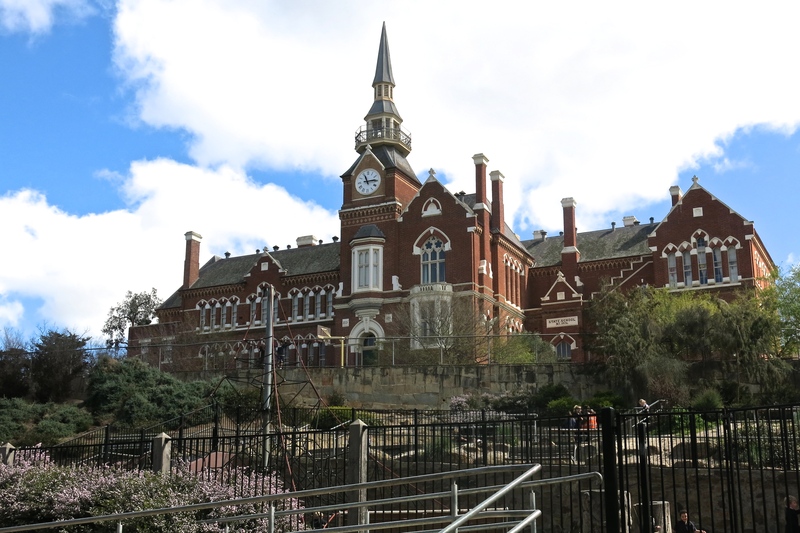 Then to Horsham … where I didn’t take even one photo despite seeing houses where Barbara, Myrna and I had lived, the schools we had gone to, the hospital some of us were born in, the stretch of the weir in which I turned into an ice-block during a three kilometre swim. But it was busy, Horsham, making Hamilton which is about the same size look sleepy. We like towns with signs of life. Then west to Natimuk and Mt Arapiles, home to Brigitte Muir the first Australian women to climb the Seven Summits, the highest peak on each continent. The sharp face of Arapiles contains series of famous climbs. The main reason though was for a detour through the Little Desert, an arid but complex paradise of small things. 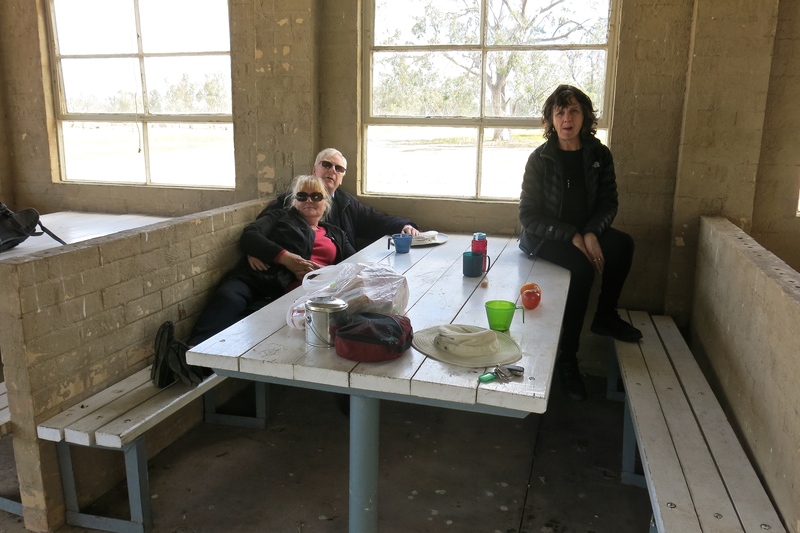 We lunched at Nhill. After dallying in the Little Desert we got the tail end of the offerings at Oliver’s, a resto set up to employ disabled people and going very well by the look of things. We chose to spend two nights in Rainbow because it was a suitable step off to Wyperfeld National Park which had adherents in the group and also because Rainbow has its own low key delights. We drank the Eureka Hotel out of red wine for example — monumental drinkers in our party! But, yes, while plenty of beer was available, that bottle of Shiraz we drank was the last one they had. And it was 10 dollar parma night! (For those overseas: parma = veal parmagiana, in this case highly and variously modified.) And there was a very attractive open fire. It gets cold up there on the edges of the desert. And it’s got a fine set of silos, very clean air, a school fete featuring jumping castles which we just missed, and an IGA which sells most of the things you might like (including some well-aged St Hugo’s shiraz that the owner keeps largely for himself). There were also several interesting pieces of public art. Graham said this was picture of the station to substitute for a real one; but there was a station even if the passengers getting on were bushells of wheat and barley rather than people. The centre of the end of the main drag, and I think rather lovely. 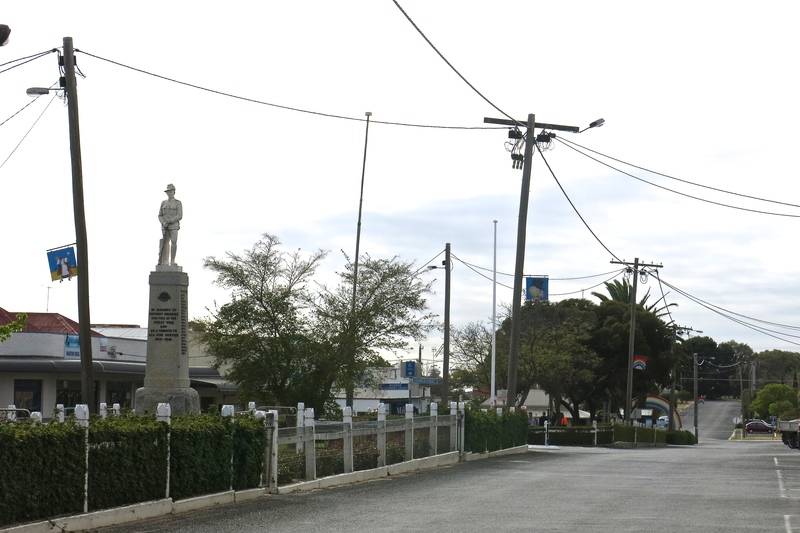 For the purposes of orientation, this is the main drag, with returned servicemen memorial. And there’s a big house at Rainbow — Yurunga. 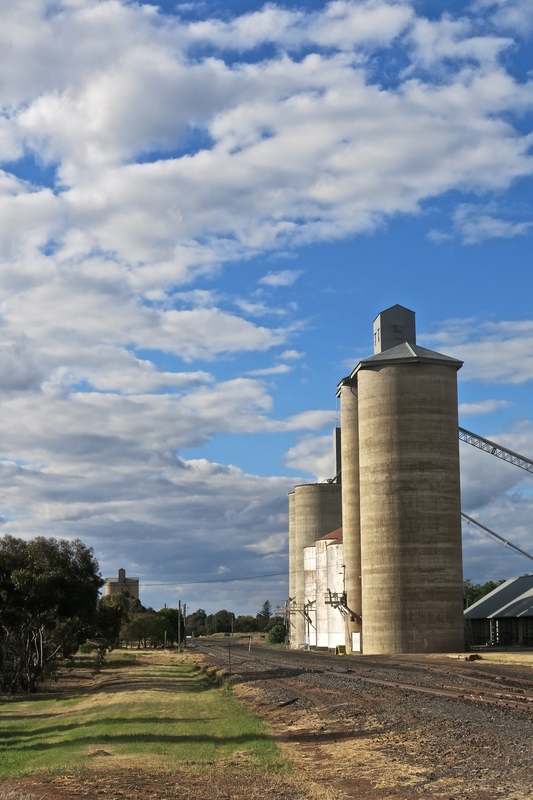 It was built in 1909, a bare 20 years after Europeans settled this part of the Wimmera, and when more grain was loaded at Rainbow than at any other station in Victoria. The town had reticulated water — goodness knows where they got it from, almost certainly artesian — 30 men were employed as blacksmiths or wheelwrights; there were golf, football, cricket, gun, coursing and turf clubs, a brass band, a debating society, a progress association. Currently, with a population of 525 at the last census, most of those are historical memories, but there’d be worse places to live. 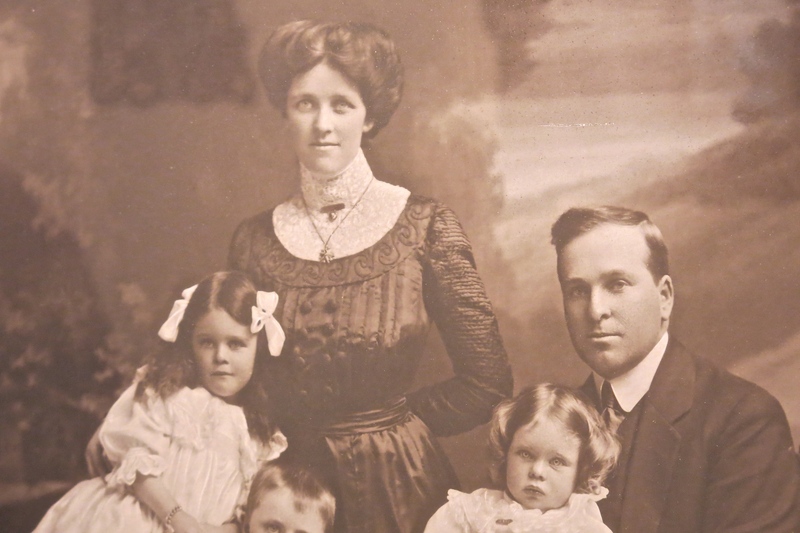 Yurunga was built by the Cust family who had also acquired a shop and 6000 acres. The shop burnt down one year later, but they built another. 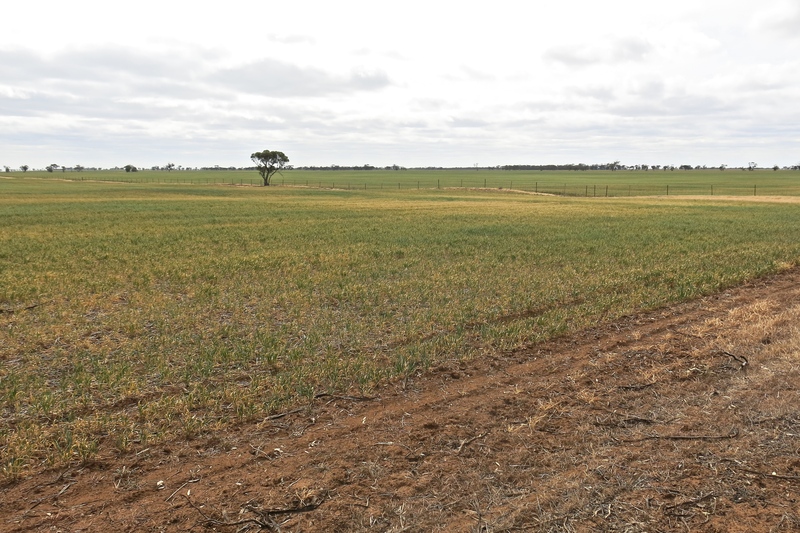 However, after three years they’d had enough and moved back to Melbourne, a very common story in this marginal country, never really meant for agriculture, paying costs in perhaps one of five years. 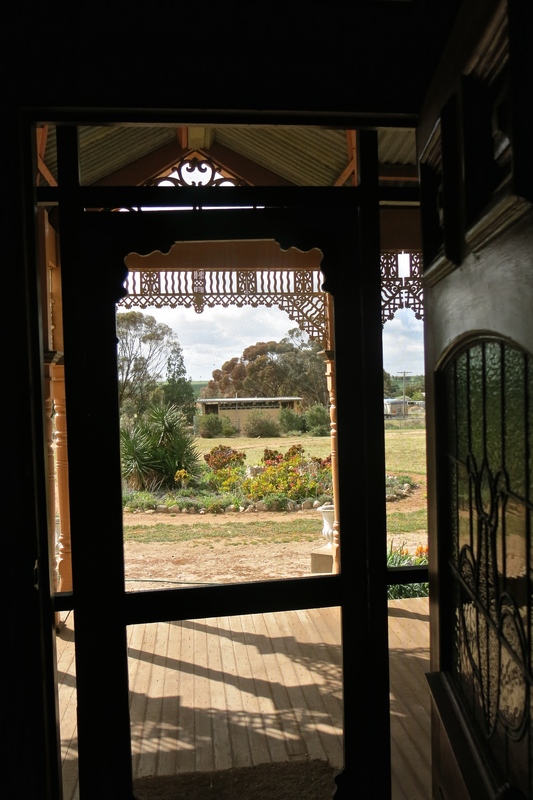 The house has a certain splendour nonetheless, verandahs all round, a climatic accommodation completely ignored by the chaps currently building houses in Horsham where even eaves are considered anachronistic if not obsolete. As long as the refrigerated aircon works, I suppose, who cares … This house had a coach house, a school room, a tennis court, a kitchen garden and an underground dining room. 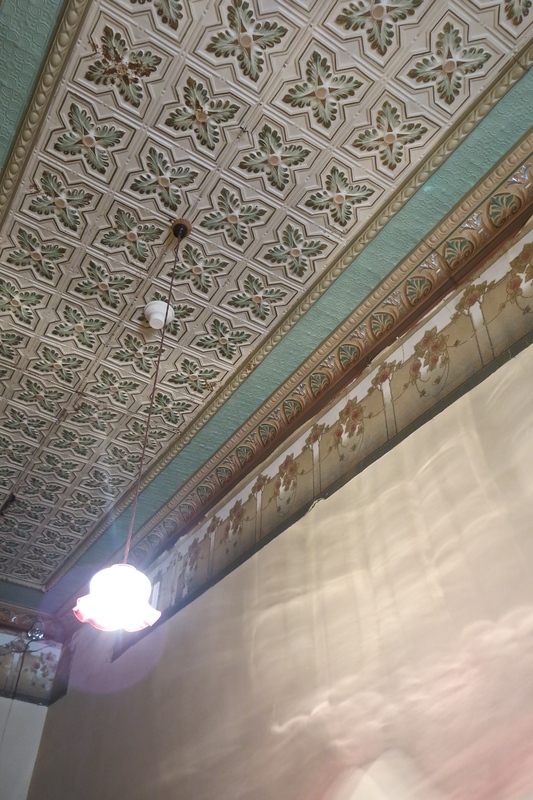 Not to mention pressed tin ceilings and a fine view of unused municipal conveniences at the end of its very grand passageway. But, despite beguiling Graham (we still haven’t heard the outcome of his offer for the whole of the main street), we hadn’t come for the built environment. Nature beckoned. The Wimmera River rises at Mt Cole quite close to Langi Ghiran where we’d begun our business. It runs through Horsham and Dimboola on its way to nowhere. 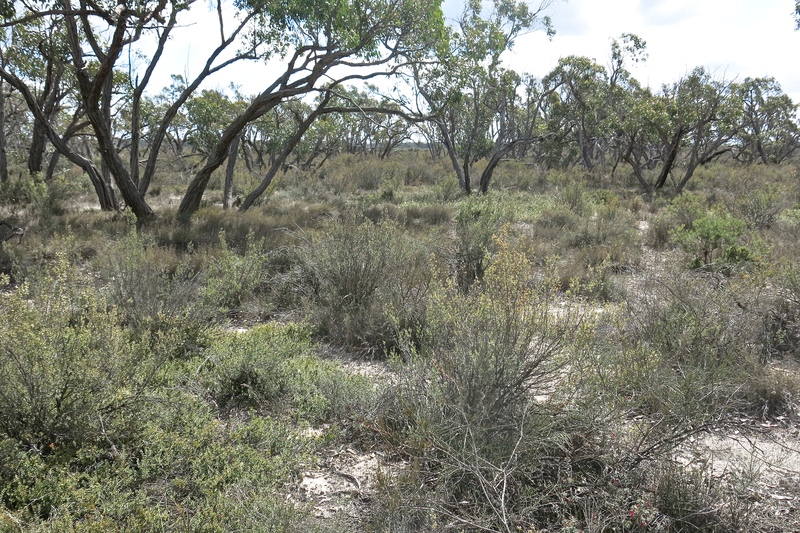 It has the distinction of disappearing first into Lake Hindmarsh, the largest body of water in Victoria when it is full (almost never), then on into Lake Albacutya, then into Outlet Creek and on into a series of mysterious sites: Black Flat, Lake Brambruk, Lake Jerriwirrup, Lake Agnes and finally the Wirrengren Plain. And if you think Rainbow is a bit out of town, try the Wirrengren Plain. Although amazingly, whitefellas have tried to live there running sheep and cattle. 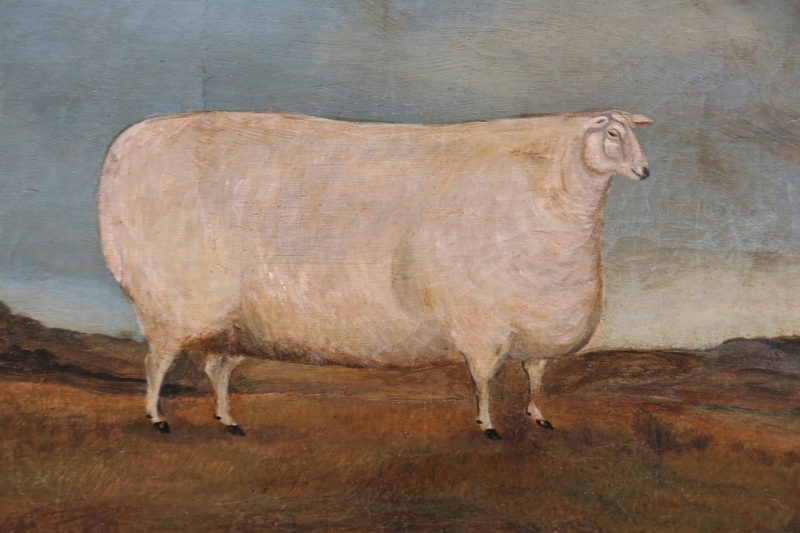 Dingoes got the sheep, and the dry got the cattle — the shortest of shrifts. 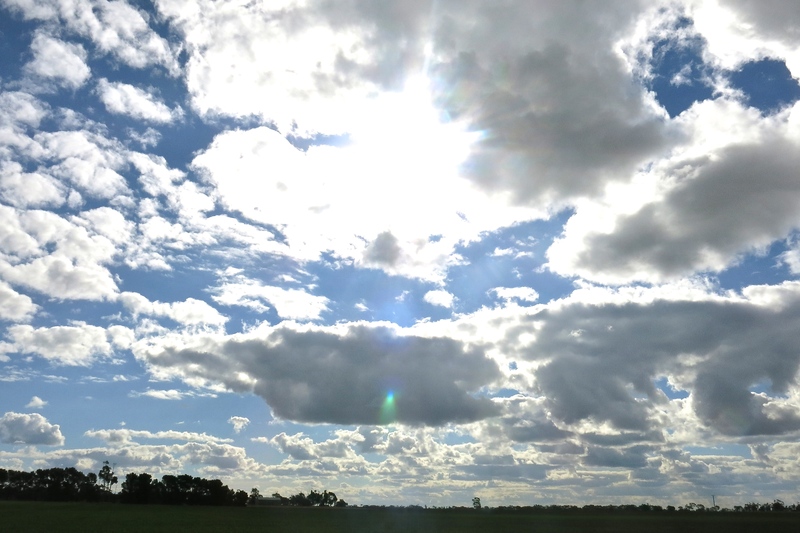 There is a record of water covering the Plain in 1854. In 1917 Pine Plains some kilometres to the south got wet to the extent of flooding. In 1957 it covered Black Flat and with record rainfall in 1975 (when I was trying to build our house in the Grampians) Lake Brambruk filled. Since then, due partly to the imposts placed on the river downstream (weirs, irrigation, town water), these ‘bodies of water’ have almost always been dry. 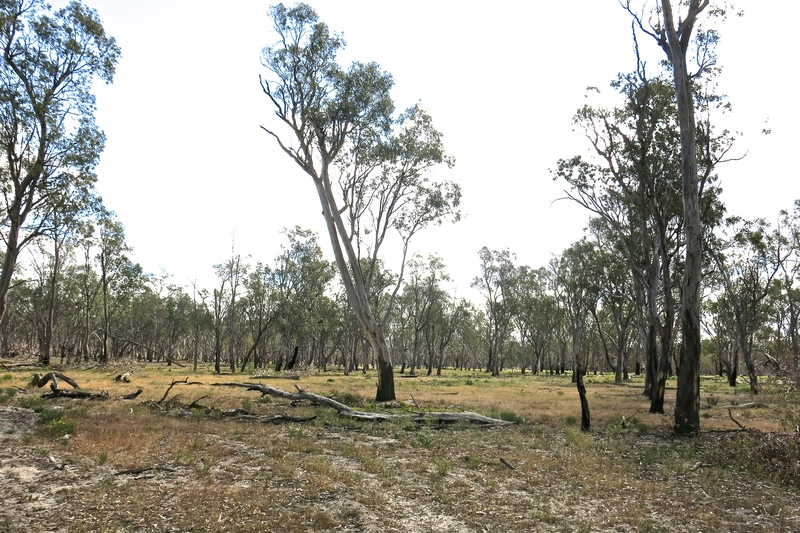 This means that the red gums which fill these depressions will die. They need wet feet at least every 20 years to keep going, and that will change the landscape forever. This is Lake Brambruk today. The Wimmera river doesn’t run anywhere. It just disappears into the sand. 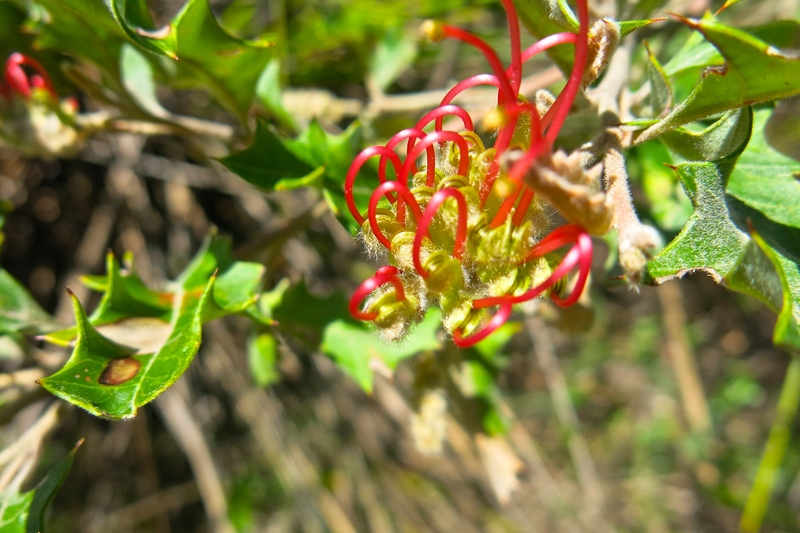 Apart from the two big ‘lakes’ these places are all in Wyperfeld National Park, a collection of different semi-arid environments with astonishing bird life and a wonderful sense of quiet. 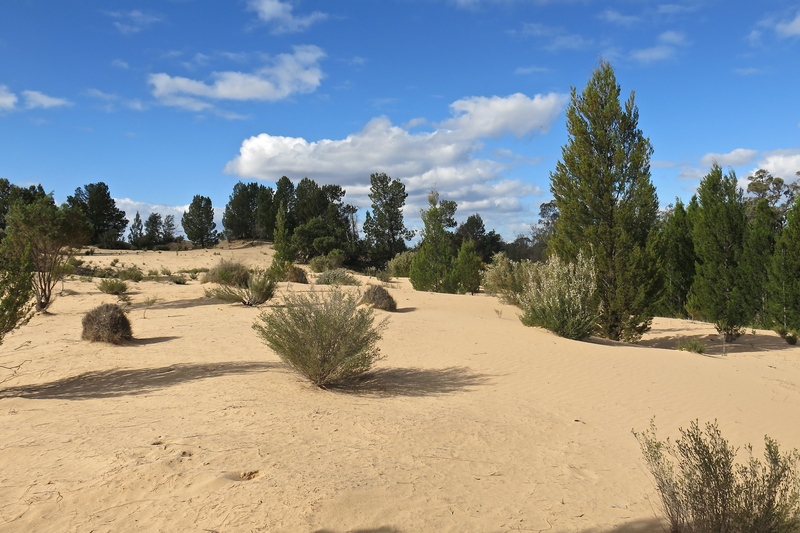 Sand dune country with stands of callitris, native pine, which does not regenerate after fire. After recent huge fires about 60 percent of the callitris in this area has been wiped out. More cheerfully, Graham and Barb proved their indomitability here with a very satisfying walk. 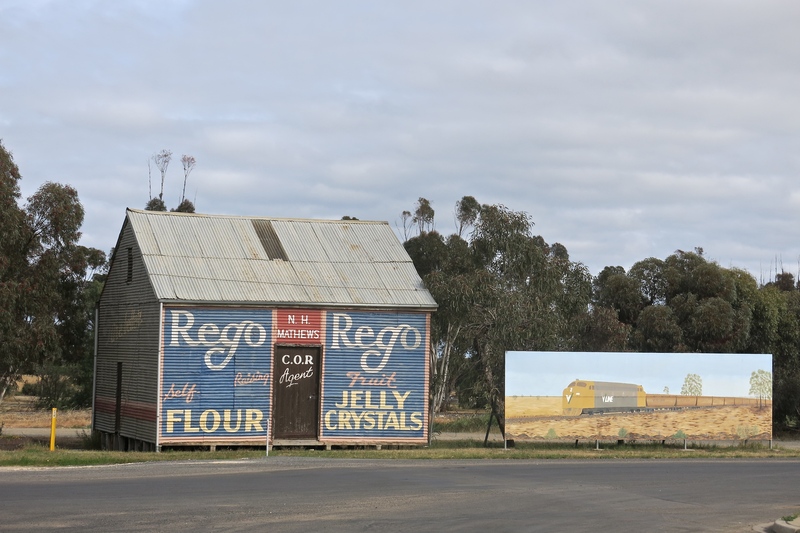 If north is up, it was mostly downhill from here, except for one great drive almost along a line of latitude: Rainbow, Kenmare, Beulah, Birchip, Wycheproof, Boort. It was very interesting to look at the variation in the crops over this 150 or so k.s. Those near Rainbow needed a soak, near Boort they’ll have a good year. But round Beulah and Birchip they might as well be putting their money on horses. This is what tens of thousands of dollars of seed, chemicals and labour sinking into oblivion looks like. These crops won’t even provide feed. I’d been to Boort not long ago to talk to a teacher of Indonesian there, and found the delight pictured below. 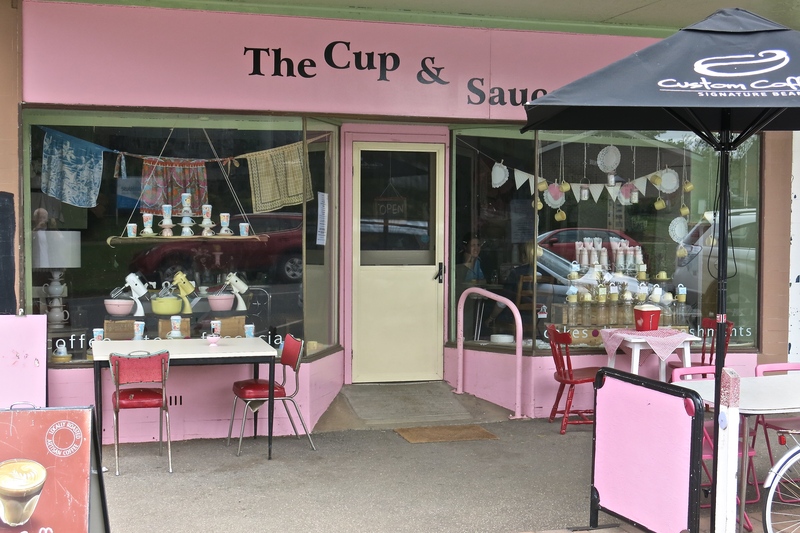 Great home-cooked food, good coffee and the sort of individual flourish that, sometimes, rural Australia allows. Look at the windows. This is a masterpiece of the genre. You may be wondering about the stock in this area. Fortunately we have renderings of same. Big fellas aren’t they? There is even a town, district maybe, named after the Durham Ox. The caption on the pic reads ‘Henry F. Stone and his Durham Ox 1887. 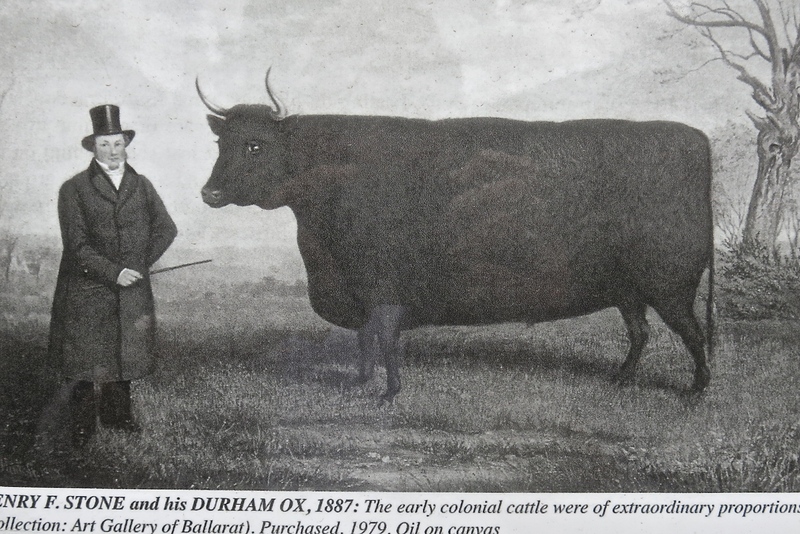 The early colonial cattle were of extraordinary proportions.’ (But um … that extraordinary?) 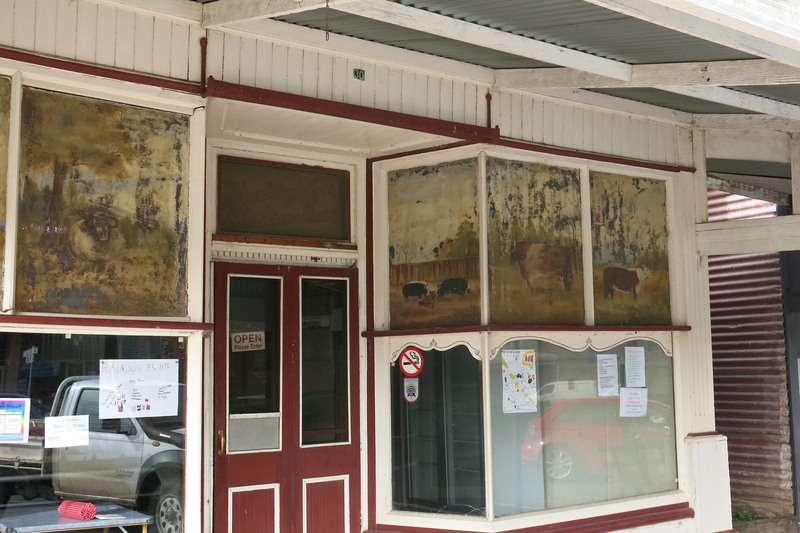 The sheep was found in the Bendigo art gallery and the cow was wandering the streets of Boort, just over the road from ‘The Cup and Saucer’. 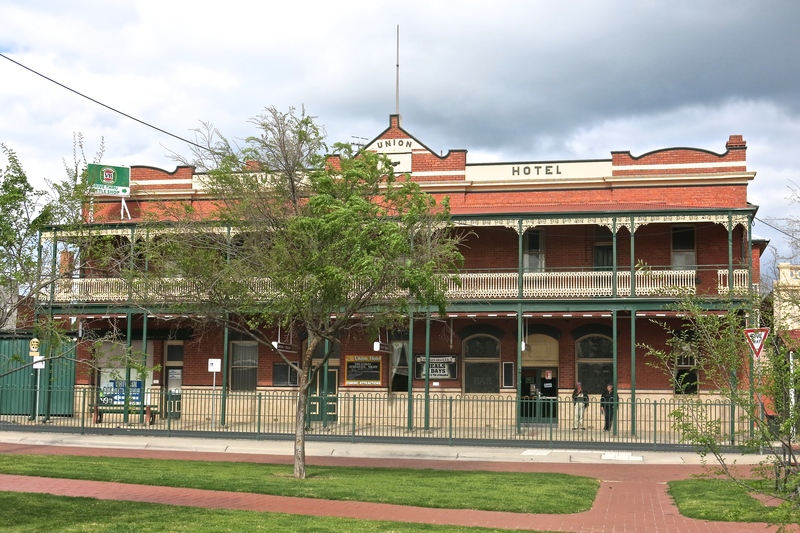 We did go through Birchip, for one year my home and, albeit a slightly different colour, this was my home. 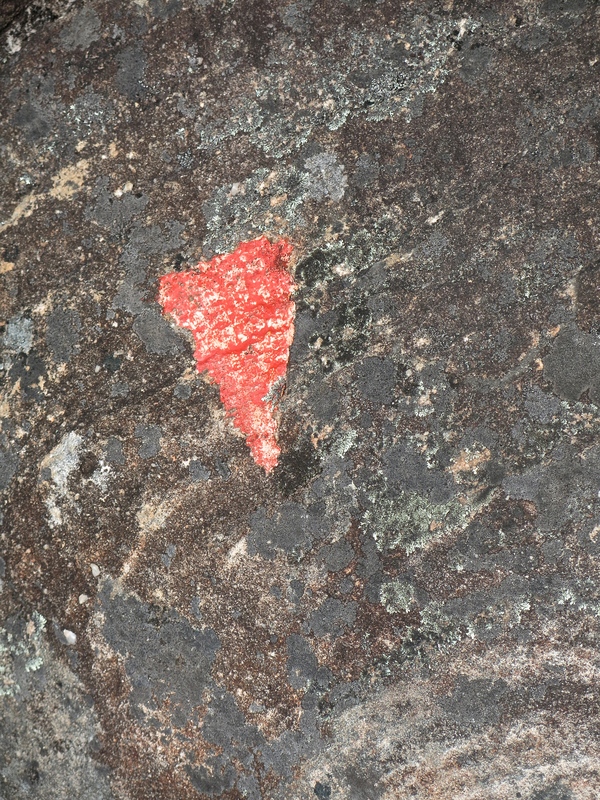 And I found it difficult to resist this pic from the top of Mt Wycheproof, billed locally as ‘the smallest mountain in the world’, towering a grand 43 metres above the surrounding plain and consisting of a unique substance known as Wycheproofite. How good is that! Its the first frame of my first film and featured me driving along that long straight line of latitude towards my first job. 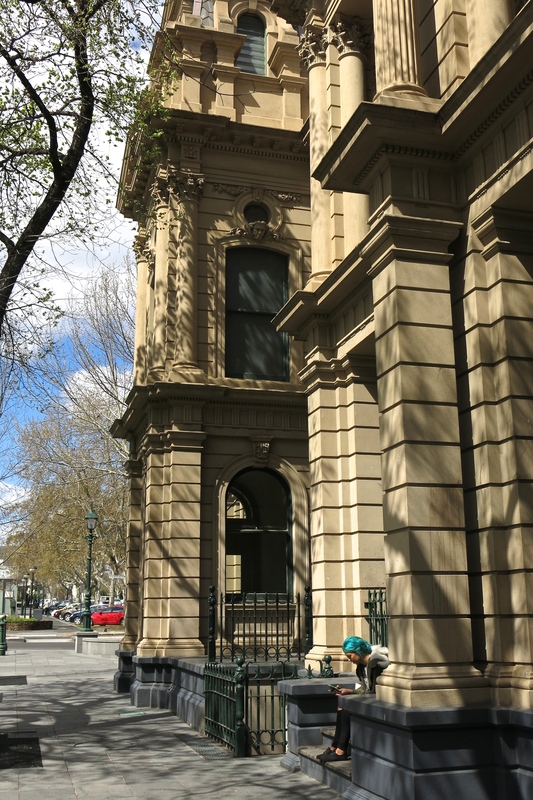 Before getting back to a more contemporary home, we drank in the delights of Bendigo where Barbara grew up. When I think of gold field towns I always think of people who found nothing and went home disappointed. But some people made some money. Obviously. These were the days when public building was public building and meant to last. I give you Camp Hill Primary School. The Town Hall. 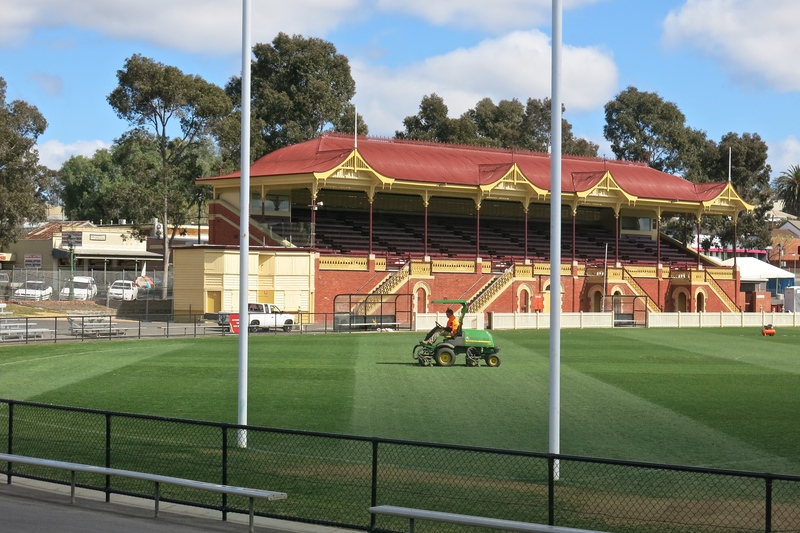 That’s pretty Bendigo. But so in it’s way is this. This is the interior of the Great Stupa at Myers Flat perhaps 10ks from the centre of Bendigo. It is only half built, will cost upwards of $20 million and is designed to last 1000 years. 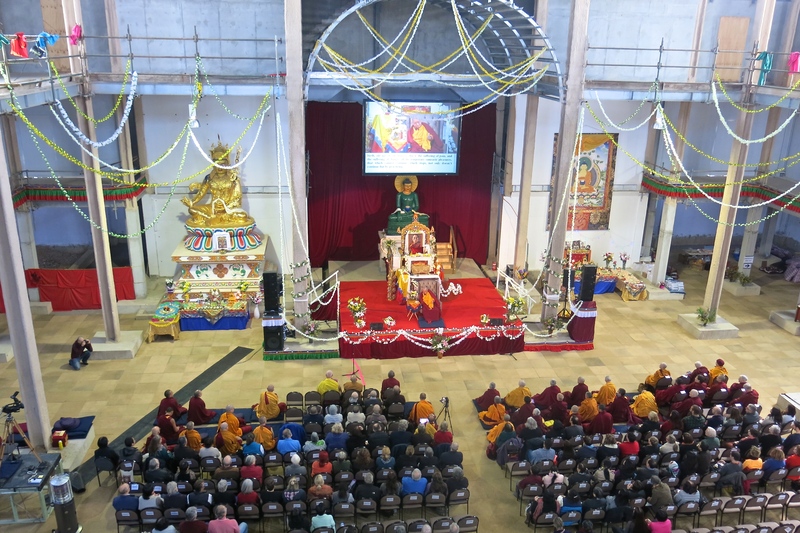 It will have attached a convention centre, a hotel, a monastery (built), 80 houses, a school, etc. The (somewhat unprepossessing I’m sorry to say) Buddha has been carved out of a single piece of jade and is the largest, most expensive etc etc etc. Like so many other things on this journey this all appeared as a delightful surprise. How busy we ants are! What a piece of work is man. How noble in reason, how infinite in faculties. In form and moving how express and admirable. However, along with my Danish friend, there has been a stern inclination of late, for reasons which I’m sure are widely felt, to lose all my mirth.